All of the pergolas we sell and install also come with a number of outstanding benefits that are sure to impress. Thanks to an electrostatic finish, your pergola will be exceptionally easy to clean and will be resistant to scratching. You can also rest assured that your new investment will be long-lasting, since it will be made of heavy-duty, extruded aluminum. Plus, our beautiful pergolas will add to the beauty and style of your backyard in St. Paul, MN, turning the area into an aesthetically pleasing outdoor living space you and your loved ones can enjoy. You’ll be able to choose from a variety of pergolas, including attached, freestanding, and garden arbor, so you are sure to find a design that will perfectly complement the style of your home. 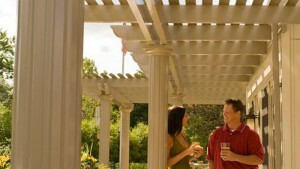 For more information on the pergolas we have available, contact U.S. Patio Systems and Home Remodeling today. Our specialists will gladly answer any questions you have and can tell you more about all of the excellent products and services we offer to homeowners in the St. Paul, MN, area.